If you've visited the App Store for iMessage, you know just how overwhelming it can be. It seems like everyone has launched a sticker pack or an iMessage app! So which ones should you try? 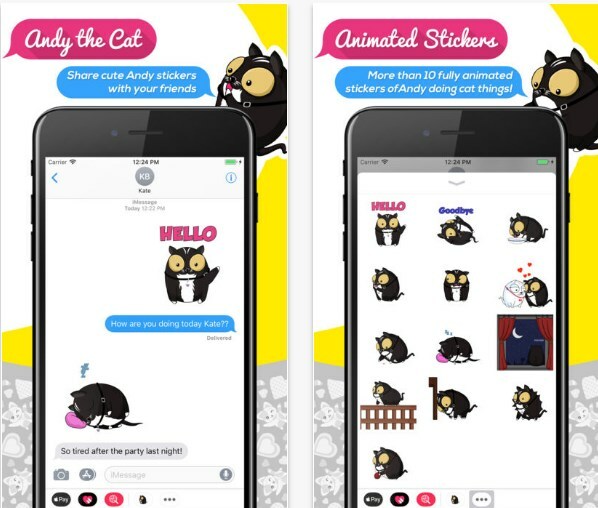 After loading up on dozens of stickers and apps from the App Store for iMessage, this is the one we love the most so far - Andy the Cat Stickers. Read on and see why we chose it to be our Stickers App of the Week! What is Andy the Cat Stickers all about? Recently there has been a new sticker app released on the App Store and we simply love it! The app is called Andy the Cat Stickers, an adorable sticker pack developed in remembrance of the cute cat Andy. The creator of this app, Kevin Goodchild, managed to bring us fully animated stickers of his cat Andy doing regular and funny cat things! Andy the Cat Stickers can be used only for iMessage, on both iPhone and iPad. The app features more than 10 fully animated and sweet stickers of Andy the Cat, doing all kinds of hilarious cat stuff, like walking along the fence, to constantly meowing while you try to sleep. He loves a bowl of milk but he won't share it with his girlfriend. Overall, he’s too cute to resist! In this app you’ll find all kinds of stickers, from smiley, to angry faces, cute faces, etc. All you got to do is install it on your iDevice, choose the sticker you want to send and easily share it with your friends and family. You can have Andy the Cat Stickers for only $0.99, just click the link below and download it right away!